Someone rightly said that “a camel is a horse designed by a committee.” Recently I got a “report of Tiger Mortality (T30)” which is a hilarious read, but for the fact that it was about a wild tigress dying in Ranthambhore. A scan of the report is there at the end of this post. 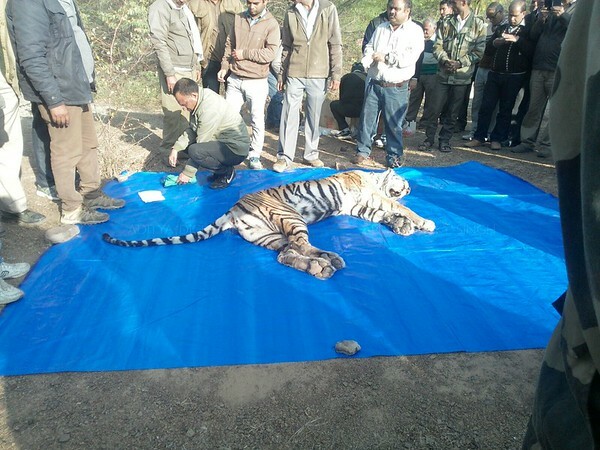 Get a veterinary doctor to tranquilise the tiger and do for medical treatment, immediately. 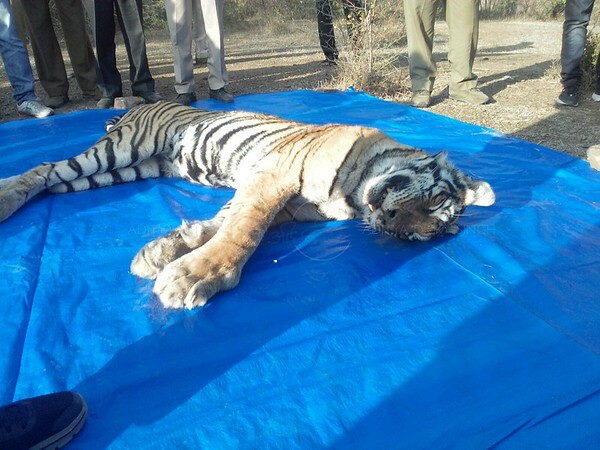 But that is not how it is supposed to work because we have a Central Government agency – The National Tiger Conservation Authority (NTCA) which assumes that Forest Department officials, including veterinary doctors with decades of experience with wild life, do not know a thing and they need assistance of randomly created committees to take any decision. NTCA has accordingly come out with a number of SOPs (Standard Operating Procedures) that they expect all the tiger reserves to follow, even though it is not mandatory for the reserves to follow them. I think it is funny that we have the same set of SOP’s for all tiger reserves of India, even though the ground conditions are totally different in different reserves. There were probably 50% odds of saving the tiger with medical treatment but since the SOP had to be followed, these odds became 0%. The NTCA “is a statutory body under the Ministry of Environment, Forests and Climate Change constituted under enabling provisions of the Wildlife (Protection) Act, 1972, as amended in 2006, for strengthening tiger conservation, as per powers and functions assigned to it under the said Act. The National Tiger Conservation Authority has been fulfilling its mandate within the ambit of the Wildlife (Protection) Act, 1972 for strengthening tiger conservation in the country by retaining an oversight through advisories/normative guidelines, based on appraisal of tiger status, ongoing conservation initiatives and recommendations of specially constituted Committees.” (this information is from their website). Here are the important parts of the report (in bold) in the words of the Field Director of Ranthambhore Tiger Reserve. Hats off to the Field Director of Ranthambhore Tiger Reserve, Mr. Y.K. Sahu who has been associated with Ranthambhore for over 30 years for writing such a brilliant report. If you read between the lines you will understand how the system works and how it is nearly impossible to do any good work in time, for it to be effective. An average “tiger activist” and there are more activists than tiger in India, swears by the SOPs even though most of them have never read them. Read on and then decide for yourself, don’t take my word for it. For the benefit of those who don’t know Ranthambhore well, this village is at least 2 hours drive from the headquarters. 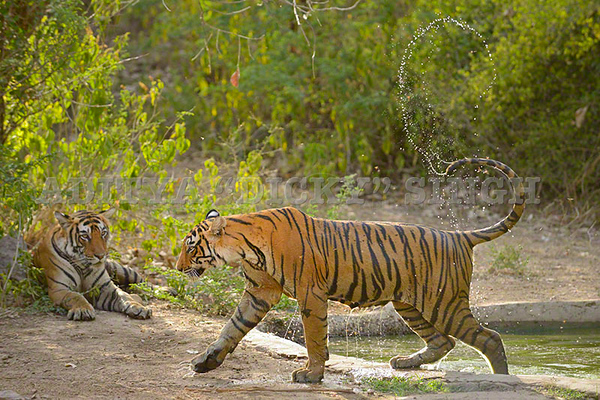 On this day the Ranthambhore Tiger Reserve decide to follow the SOP, in fact they ended up following three sets of SOPs to the tee. “Procedure was initiated in accordance with the SOP to deal with orphaned / abandoned tiger cubs and old / injured tigers in the wild.” Now comes the really funny part. 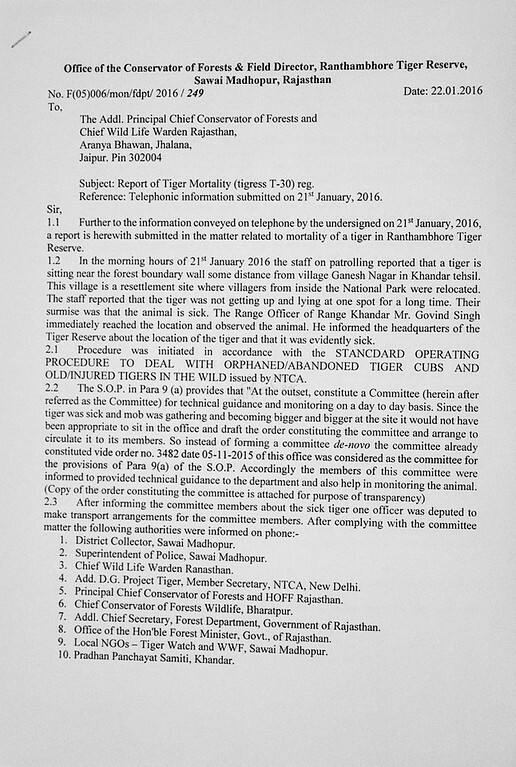 Step 2 – “After informing the committee members about the sick tiger, one officer was deputed to make transport arrangements for the committee members.” What is truly funny is that many members of the committee do not even live around Ranthambhore and some of them would have taken a day or more to reach the spot. But how does that matter as long as the SOP is followed. 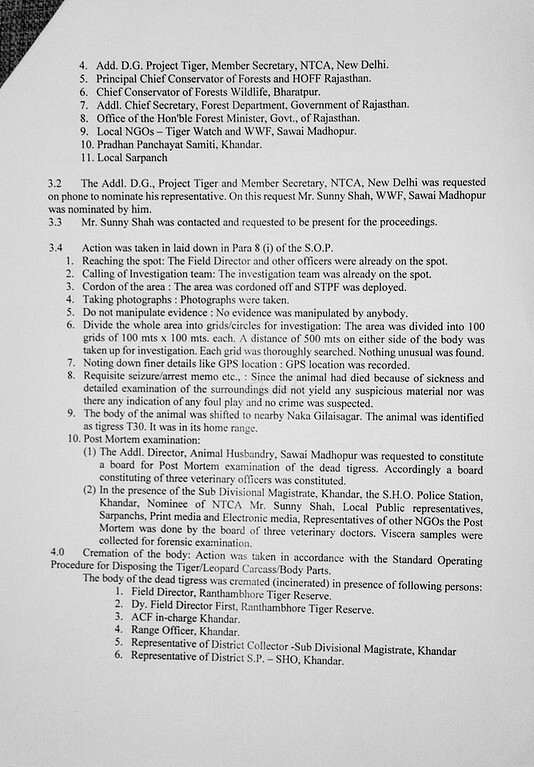 “After complying with the committee matter (which in reality must have taken a few precious few hours, during which some of the most experience Forest Officers were busy sorting out paperwork in the office instead of being at ground zero)…the following authorities were informed on the phone.” The report lists 12 authorities that were informed and this would have taken another hour. An interesting thing is that out of these 12 authorities who have to be informed the only ones (except for two local NGOs who work with wildlife) with wildlife experience were in Jaipur or in Delhi. They could not have helped in any way. Step 3 – “Rescue team along with a veterinary surgeon and requisite equipment were dispatched for the spot about 50 kilometres from the headquarters.” That would have taken another two hours as the roads are very bad. 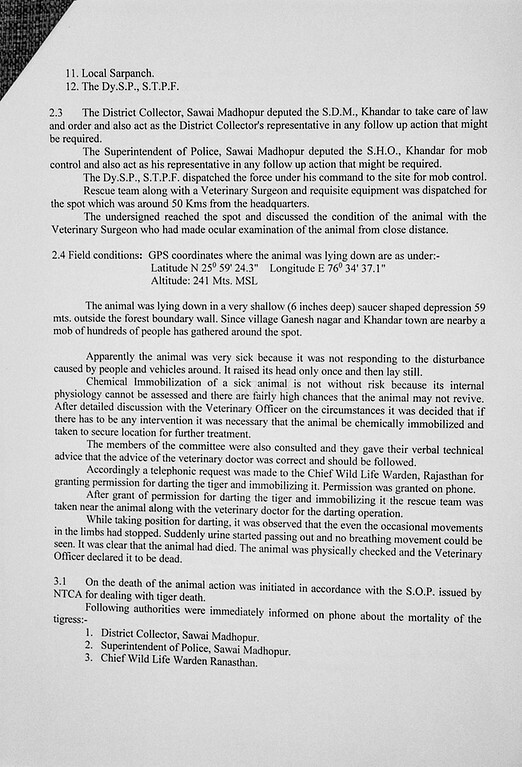 Step 4 – “Apparently the animal was very sick because it was not responding to the disturbance caused by people and vehicles around…….mob of hundreds of people had gathered at the spot…..The members of the committee were consulted (on the phone as none of hem were in a position to reach there despite transport arrangements that were being taken care of by another officer with decades of wildlife experience) and they gave their verbal technical advice that the advice of the veterinary doctor was correct and should be followed.” The Field Director did not state the obvious here that none of the committee members had any clue on how to deal with any sick animal, leave alone a wild tiger. So the obvious answer was that the Veterinary doctor is the only one, out of all of us, who knows what to do, so do as he goddamn says. If the SOP was ignored the Forest Department would have reached this stage in two hours and not six to seven hours that it took because of the SOP. The veterinary doctor insisted that the tiger be tranquillised before any treatment could be started, which is a good idea because in my opinion you have to be absolutely drunk to start treating a wild tiger without tranquillising it. Step 5 – “….a telephonic request was made to the Chief Wildlife Warden, Rajasthan (he is in Jaipur over 200 kilometres away) for granting permission for darting and immobilising the animal….permission was granted.” That probably saved the veterinary doctor’s life. Step 6 – “While taking position for darting………….it was clear that the animal had died.” Hats off to T 30 that she survived so much of red tape for so long. This was the end of one chapter. Step 1 – “Following authorities were immediately informed on the phone.” The report lists 11 different authorities. Again what the report does not mention is that the cell phone network in the area where the tiger died is very dodgy. Step 3 – “Mr Sunny Shah was contacted and requested to be present for the proceedings.” It took an hour to get a representative nominated and then it took another three hours for the representative to reach the spot. Why rush things. Reaching the spot: The Fiedl Director and other officers were already on the spot. Calling the investigation team: The team was already at the spot. Taking photographs: Photographs were taken. Actually the photographs had gone viral on social media a few hours ago. Do not manipulate evidence: No evidence was manipulated. Divide the whole area in grids / circles for investigation: The area was divided into 100 grids……nothing unusual was found. Noting down finer detail like GPS locations: GPS location was noted. I forgot to tell you that this was done for the first SOP too but it had to be done again as the SOP demands that. Requisite seizure / Arrest Memo: Since the animal had died of sickness……….no crime was suspected. The body of the animal was shifter to Gilai Sagar naka (forest check-post). the animal was identified as T 30. It was in its home range. Post Mortem Examination: Additional Director. Animal Husbandry, Sawai Madhopur was requested to form a board for post mortem examination….and a board of three veterinary doctors was constituted. In presence of…….a number of authorities are listed……..the post mortem was conducted….viscera smiles were collected for forensic examination. 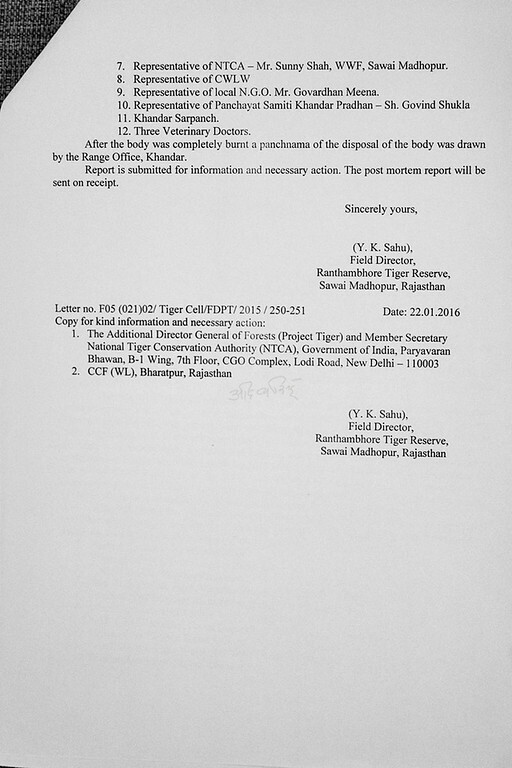 Step 1 – “The body of the dead tiger was cremated in presence of the following persons …………it lists 12 different groups of persons.